Who wouldn’t want to see an MSI Wind PC (U100) taken apart? Especially given that it’s one of the first Intel Atom-powered netbooks to be available (hopefully soon) on the market. As pointed out on jkkmobile, you get a sense of the size from the 2.5-inch hard drive and comparing it to the rest of the ultraportable. By the way, it (the hard drive) does appear to be upgradeable if you are willing to take it apart, so you can either scale up in capacity (think 250GB) or make the move to Solid State Drives (SSD) (Think the cheaper drives from Super Talent Technology that are available from online retailers). Can’t wait for benchmarks to start rolling out. Note: To view the original photos, on the Mobile01 page above click on the links embedded in the article and they will expand/drop down. 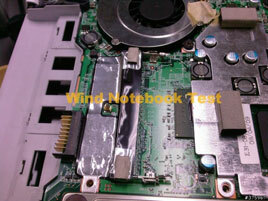 This entry was posted in Articles, Featured, MSI, Netbook, Reviews. Bookmark the permalink. ← Apple Tablets This Fall? Finally?